When you start anything new, there’s typically a learning curve – and EM2WL is no exception. Many of us step in to this journey with similar backgrounds, having made similar mistakes, and hit similar brick walls. We decide to take a chance on this “eat more” thing, and see where it takes us. Then, many of us end up making one of two HUGE newbie mistakes. Landing ourselves back at square one. When just getting started, you don’t need to do everything that people who have been working out for years are doing. 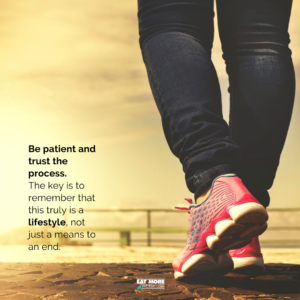 After a certain amount of time in this journey, we all will HAVE to step it up – but doing so before it’s time can actually hurt your progress in the long run. One reason we often get caught in the dieting yo-yo is because we mistakenly assume that if we eat at a minimum and workout at a maximum, then we can get results faster. We eventually find out that all we really did was speed through the stop sign, only to get pulled over for reckless driving. Unfortunately, this approach leads to eventual burnout, isn’t sustainable, and can kill your metabolism. Think less is more when it comes to working out, and eat according to your activity (in other words, match them — not increasing one, while decreasing the other). Start slow and take baby steps that make sense for you and your life so you can create a healthy, sustainable lifestyle. Starting anything new can be scary. But when you get too scared thinking about what it will take to achieve your goals, you may find yourself never even starting. For people just beginning, the idea of eating more and working out less can be scary, backwards-sounding, and confusing. The under-committed beginner (my own hands waving wildly in the air at this point) wants to know all the information before diving in. Understandable, but one will never really be able to know (or even comprehend) all of the the information before embarking on a new endeavor. Every new journey has areas that you will not understand until you are in them. Someone could describe it to you perfectly, but you will never know for yourself until you experience it. Remember transitioning from teen, to adult? Or becoming a new parent? There were likely parts of those journeys that someone probably did tell you about, but you didn’t understand until you were in it. 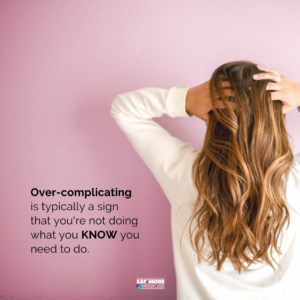 Convincing yourself that you must have every strand of proof, know how to prevent every obstacle, predict every milestone — with exact timelines to boot — is what we call analysis paralysis. Unlike becoming the Over-Committed-Burnout, being an Under-Committed-Over-Analyzer, can lead you to never really starting. When you find yourself overcomplicating an issue, remember that it’s typically a sign that you are actually procrastinating on doing what you know you need to do. Gather “enough” info and just start. You can always tweak as you go. You may have started off doing too much too soon, and fallen away – or perhaps you’re still doing nothing at all with the info you have. Either way, the end result is…frustration with not moving forward. Standing still, falling behind, or even running in place, are usually the exact reasons that we started this journey. Yet, this version of standing still tends to weigh heavier on us (because we were scared from the start! ), and causes us to want ditch eating more, and run to the nearest quick fix (#comfortzone). Be patient and trust the process. The key is to remember that this truly is a lifestyle, not just a means to an end. So whether you need to turn things down a notch, or simply start – know that you’re not alone. We’re all navigating these waters together, and every person who has had success on this journey has come to a similar crossroad (hmmm…metaphor overload? LOL). Kiki, thanks for this post. I tend to undercommit b/c I am overanalyzing everything, trying to get all this information and every detail nailed down. 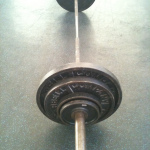 Then, I end up doing nothing…..and time is wasted again and the weight still adds on. I am very frustrated and overwhelmed with all this information that comes from everywhere. One thing you hear contradicts something else that you’ve heard. It’s just very confusing. I want to be able to be healthy and enjoy my life without stressing about everything. I want to find a way to make this a way of life for me and not something that’s too complicated to keep up. I look forward to learning more from you as you post these blogs and your Periscopes. Thanks again!